Literary and music group Feest der Poëzie brings a theatrical lecture on the life and work of Oscar Wilde and one of his favorite beverages – absinthe. This Saturday at the Pianola Museum, 8.30 PM. Immerse yourself in the story of one of the best-loved writers in the English language with prose, poetry, songs and drama by Oscar Wilde and his contemporaries, on a journey through his rise and fall. 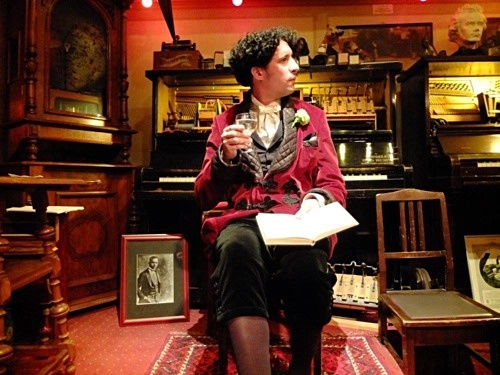 Poet and absintheur David Kwa will demonstrate the absinthe ritual and read manifold roles, such as that of the dreaded Marquess of Queensberry. Daan van de Velde (piano) and Susanne Winkler (soprano) will perform Irish and English art songs, as performing poet Simon Mulder takes on the roles of narrator and Oscar Wilde (indeed, wearing a contemporary pair of silk breeches) in the fascinating story of his life. Also, Van de Velde and Mulder will bring the very special performance of a long lost work for piano and voice on Wilde’s ‘Ballad of Reading Gaol’ by early 20th century composer Henri Zagwijn. The Poetry Bar will bring you carefully prepared absinthe, along with a decadent sonnet.